I was very fortunate to be sent a Dyson Supersonic to test for two weeks – I literally squealed with excitement when it arrived. 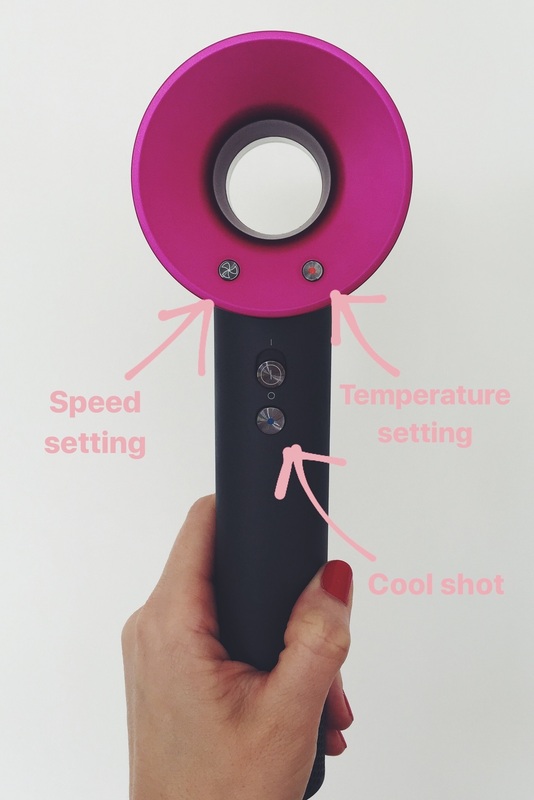 I have been blow drying my hair for nearly 20 years, and have been using a salon-quality hairdryer (Parlux) for almost 15 of those years, so I really feel like I am qualified to give you a thorough review on the pros and cons (of which there is only one, to be fair) of this magnificent piece of equipment. The engineers (103 of them!) behind the Dyson Supersonic aimed to create a dryer that could style the hair without extreme heat, thereby reducing damage to the hair’s cortex, resulting in healthier, stronger hair. They achieved this by combining a powerful airflow with a controlled temperature mechanism, which is a real feat of engineering! Over 600 prototypes were created before the final product was signed off, nearly R1 billion has been spent on research and development, and it has been tested on over 1,600km of hair in order to ensure that it can be used on every conceivable hair type. It comes with the usual attachments: two magnetic nozzles (one wider nozzle for rough drying, and a slimmer nozzle for precision styling) and a magnetic diffuser, which I did not use. It has three speeds, three temperature settings (100°C for fast drying and styling, 80°C for regular drying, 60°C for gentle drying) and a cool-shot function (28°C) – the lowest speed is obviously ideal if you’re using the diffuser, as it won’t disrupt your curls. Right, so let’s chat about how the Dyson Supersonic works, and what makes it so special (this will help put the price tag into perspective). The Supersonic has been five years in the making, and as I mentioned earlier, it’s really been put through the ringer in order to get to where it is today. What differentiates it from other dryers is that, amongst other things, there is a glass bead thermistor located in front of the heating element which measures the temperature 20 times per second. This information is fed through to a microprocessor which then adjusts the temperature to ensure that it never exceeds 125°C. Conventional dryers do not have this technology, and it can happen that temperatures reach over 150°C, at which point irreparable damage is done to the hair (this occurs when the air gets trapped between the nozzle and the hairbrush, resulting in extreme heat). 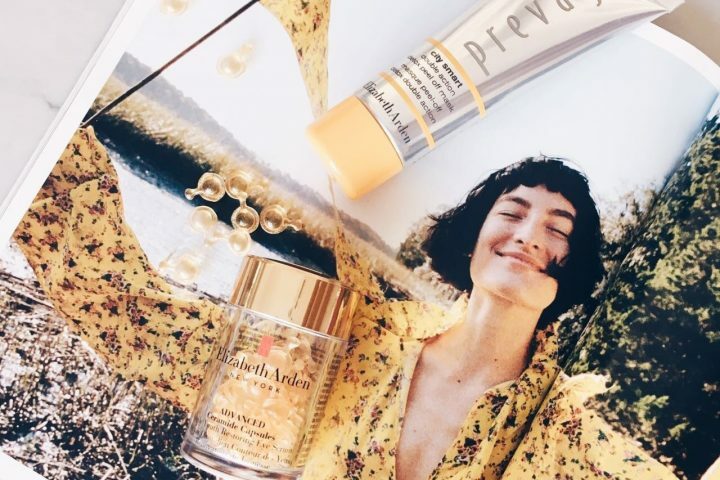 I can attest to the temperature control properties because at no point did I feel the kind of heat that I feel with my Parlux – I never felt like my scalp was moments away from being scorched, and my hair didn’t feel hot to the touch – it felt much cooler, yet no less beautifully styled. Also, you can change the nozzles at any stage without scalding your hand – they don’t overheat and become like hot potatoes. This element of the Supersonic is extremely impressive. The Supersonic also claims to be faster, lighter and quieter than any other dryer on the market, and I have found that to be true, but only marginally so. In terms of drying time, it reduced mine from 15 minutes to 12 minutes, which is great, but not mind-blowing. It is lighter than my Parlux, but only by 62g (I weighed both on my kitchen scale and, with nozzles attached, the Supersonic came in at 694g and the Parlux at 756g). 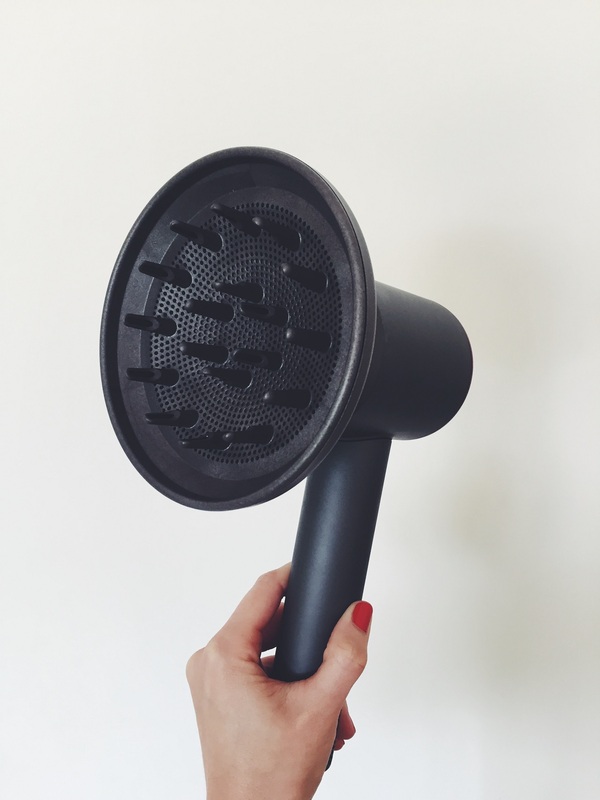 If you’re used to a much heavier dryer, then there is no doubt that you will feel a huge difference with the Dyson Supersonic, but if you’ve been using a Parlux, the difference won’t be as noticeable. 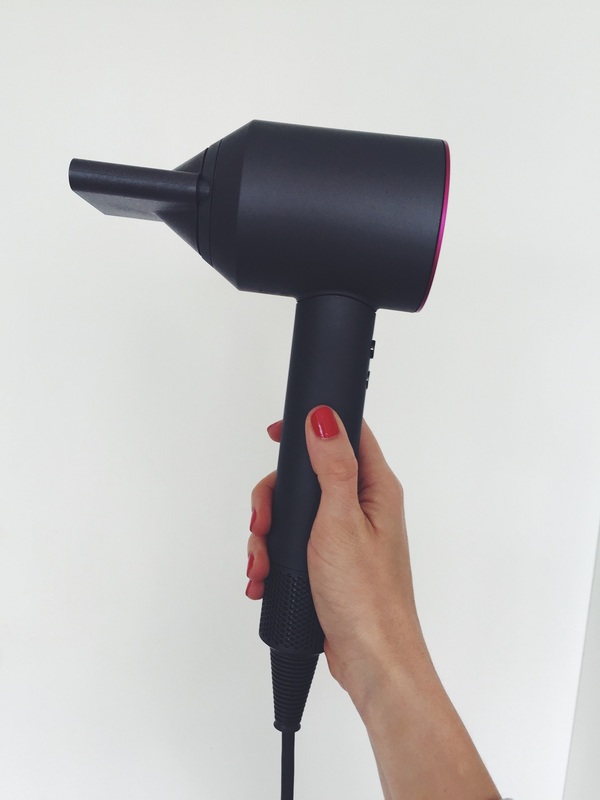 I cannot deny that it is much quieter than my Parlux – so much so that I can actually have a podcast on whilst blow drying my hair…that’s pretty incredible! The noise reduction is achieved by including more blades into the motor, resulting in a quieter airflow, and by introducing a silicone mount in the handle which reduces the transfer of noise between the motor and the handle. Elements of the Supersonic which are interesting but don’t matter enough to me to affect my opinion: the V9 motor is located in the handle, not the head (resulting in a more well-balanced and ergonomic design), and it emits negative ions to reduce static (this is not new technology though – many other dryers do the same). Now that we’ve covered the research, development and technology behind the Supersonic, we can talk about the only real con…the price tag: R6,500 (six thousand five hundred rand, just in case you blacked out there). There is no denying that it is bracing, but the question is: is it worth it, and would I fork out R6,500 of my own cash? At the moment I wouldn’t, simply because I just can’t justify it when I already have a fabulous hair dryer that costs less than a third of the price. However, if I was in the market for a new hair dryer, and I could easily afford it, I would do it in a heartbeat. If you are in that same boat, and you are willing to invest in a dryer that will reduce damage and drying time, and is an absolute joy to use, then I would definitely encourage you to buy it. What I cannot encourage is for you to buy this if you a) don’t really need it and b) can’t afford it – that would be silly. If you’re somewhere in between the two and you’re trying to decide whether or not to bite the bullet, what I will say is that the technology is undeniably mind-blowing, and if the Dyson Supersonic lasts anywhere as long as a Parlux lasts (in my experience, around 10 years), then the cost per use is really minimal – it will pay itself off in no time at all (#beautybloggermaths). If you are so inclined, you can purchase the Dyson Supersonic online here. Will you be investing? Let me know in the comments! *PR sample which was loaned to me for two weeks. 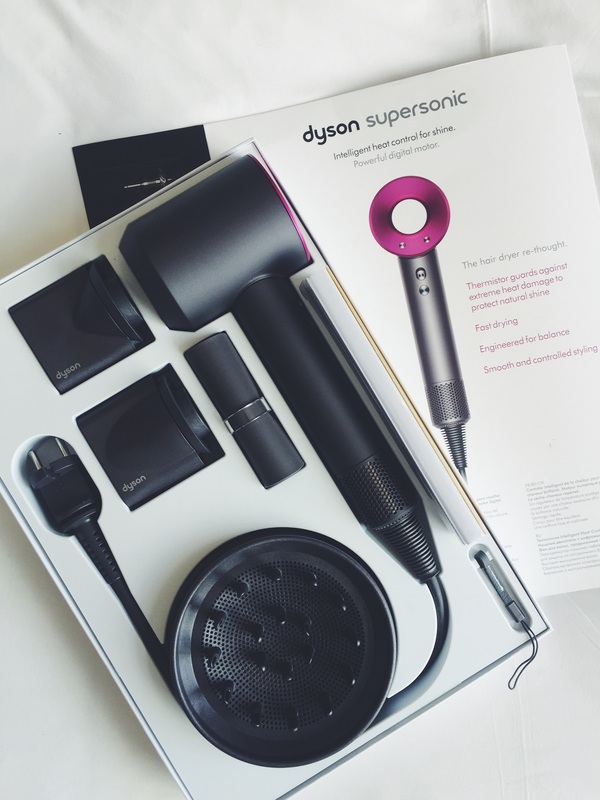 3 comments on Dyson Supersonic Hair Dryer: Worth the Splurge? 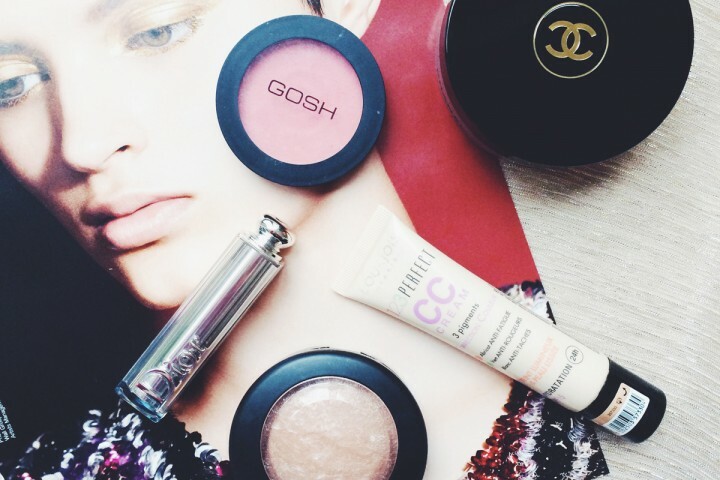 Your beauty blogger maths is correct! Cost per use makes it affordable. Much respect for the engineers. Applying their minds to very real everyday problems. What an incredible tool! I wouldn’t be able to justify that kind of money on a hair dryer – I have the GHD Air and I love it.